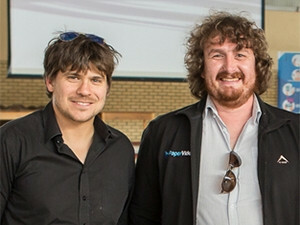 Paper Video co-founders Chris Mills and Paul Maree. Video education firm Paper Video is working to remove the barriers to learning by giving learners access to high-quality teaching offline, using their cellphones. The latest offering from the South African start-up, Subject Maps, is aimed at students in grades eight and nine, giving them access to video lessons via their cellphones, without requiring an Internet connection or incurring any data costs. Subject Maps came about through a partnership with the Actuarial Society of South Africa (ASSA), and is Paper Video and ASSA's collective response to the dire state of maths and science education in the country, especially in under-resourced schools. By using Subject Maps, students can use their own devices to access professional video lessons for every topic in mathematics, physics, chemistry, biology and accounting in the first two years of high school. "Grades eight and nine are crucial foundation years, and yet we are finding that many students, especially those in more rural and impoverished areas, do not receive the adequate grounding to continue with mathematics and physics," says Mike McDougall, CEO of ASSA. "The Subject Maps offer a powerful and cost-effective solution to this challenge." The team at Paper Video originally launched a series of past exam papers for grade 10 to 12 learners, supported by video solutions, which have now been rolled out to schools across the country. A key feature of the Subject Maps resource is that all the videos represented on the map can be watched without Internet connectivity or data, thanks to microSD cards which contain thousands of videos and can be inserted into any Android device or Windows computer. All a student needs to do is use their phone to scan a QR code next to the concept as it appears on the map, and a video lesson ranging from 30 minutes to two hours pops up on their phone, taking the student through the entire concept, step-by-step. "There are a lot of tech-based learning resources in South Africa, but almost all of them exclude the vast majority of South African students because they cannot be used without an Internet connection and data. We wanted to create a resource that does not exclude anyone due to their personal circumstances," explains Paul Maree, Paper Video co-founder and maths teacher. As a social enterprise, Paper Video relies primarily on corporate sponsorship, particularly for impoverished schools. The partnership with ASSA, which is a registered non-profit organisation means corporates can sponsor a roll-out while satisfying their CSI requirements. To date, the partnership between Paper Video and ASSA has seen the sponsorship of their video-embedded exam books to over 12 000 learners, due to projects with the likes of Momentum, Metropolitan, Old Mutual, SAB and Investec.